Summary: Artemis is up to his old tricks. But this time he is outsmarted and he needs Holly to help get him (and all of the fairy world) out of trouble. For me, young adult literature is the perfect balance to the heavier books on theology. So I read about original sin, and then I listen to an audiobook on a 13 year old criminal master mind. It is a nice way to reset the brain. Some children’s book series get too predictable (like Pendragon). It requires some good writing and not relying on what has worked before to keep a series fresh. It is only recently that I have realized that many people do not like to read series fiction. I grew up reading westerns, science fiction and fantasy and all three genres are heavily invested in series. Once you create a world, it is hard not to go back to that world and add to it. So while there are many series that get old, I have not given up on series fiction as a category, even if I don’t have time to undertake a long series straight through like I would in high school. Artemis has everything he thought he wanted in books one and two. His mother has regained her sanity. His father has been found and returned to the family. And Artemis has some of the fairy technology that he has adapted for human use and a plan to cash in and make a ton of money, legally, after one last illegal venture. But that illegal venture turns bad. He is outsmarted and like usual it affects those around him most. So Holly and the LEP have to help bail Artemis out. Mulch Diggums is back and Butler’s sister Juliet is given a bigger role in this book. Artemis’ parents are on the periphery but not actually in this book. In the end, the series is all set for another sharp turn in book four. Unfortunately, my library (which I have been checking out the audiobooks) does not have books four and five on audio (but they do have books six and seven, I hate that.) So I will have to either buy Audible or Kindle versions or check out paper. 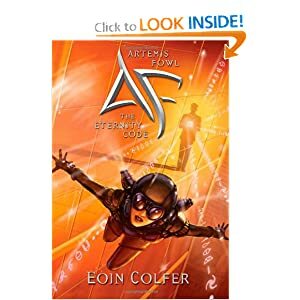 I just noticed that the Artemis Fowl series is Lendable and is on Lendle. So I have reserve books four and five for kindle.